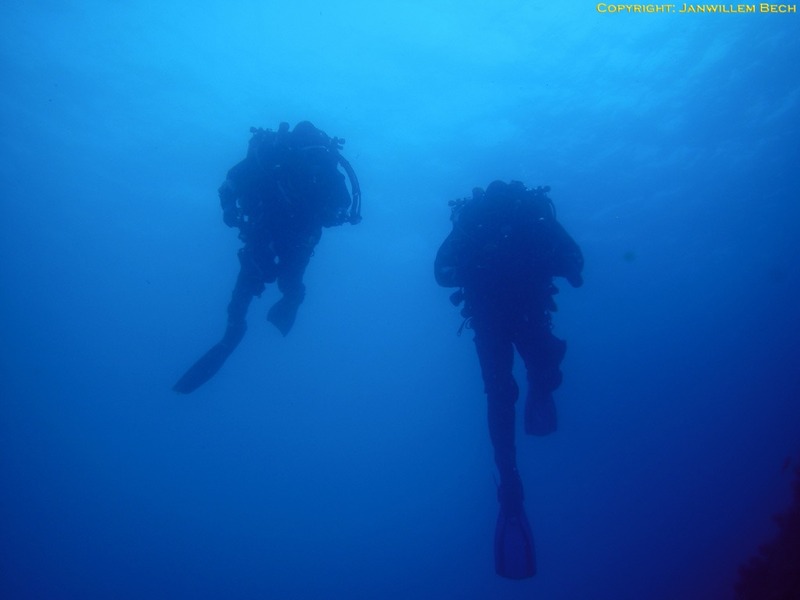 In May 2005 we planned a dive session during 5 days in the Southern part of France. The Dives were made by 5 Dutch Inspiration divers, and one Inspiration/ Kiss diver. Members of the team where: Ivo van Dam, Tino de Rijk, Rita Oosterbaan, Arjan van Waardenburg, Rob Postma and Janwillem Bech (author). All dives are made with the very experienced and friendly crew of Bormes Plongees. Check out there website here: http://www.nauticadive.com/index.htm . During the night we stayed on a very nice camping called: http://manjastre.chez.tiscali.fr/anglais.htm . We had a very nice week with excellent weather. Only the first day there was to much wind for diving "la Grec" so we decided to go to the Gabiniere reef. The rest of the week the weather was on our side and winds stayed out. We were lucky enough to meet a group of Dolphins on the surface and a Mola Mola, also called Moonfish. The dives were fantastic and visibility was good. We used our own gas that was mixed on the camping site. The owner of the camping is an Inspiration diver too, so no problems with mixing gas and cleaning our diving gear. Planning: We planned dives in the range 40 - 70 mtrs. We decided to choose a heli ir mix 13/38 to keep the preparations simple. Even with this preparation it costs a lot of time to get all bottles prepared and analysed. The END has been set to 40 mtr. For the dives up to 50 mtr bailout bottom gas was TX13/38 and the deco mix OC EAN 40. (7ltrs bailout). For the deeper dives bottom gas TX 13/38 and deco gas EAN 70 (10ltrs bailout). Because we planned a dive to 85 meters too we accepted a higher END in case of bailout. All divers except 1 used VR3 decompression computers. The other diver used HS explorer computers. Bailout tables were generated with DD plan and GAP and proplanner. We used a brother label printer to print our bailout tables on plastic foil which worked superb. No problems occurred during all 5 diving days, and we can look back at a very nice diving adventure! Max diving time 112 min, max diving depth 82,5 meters (270 ft). No bailout gasses were needed because no failures occurred. Please allow thumbs to be loaded and then click the little arrow in the thumbnail. Please use the scrollwheel and arrows left and right to see all the pictures! Click the wreck or reef name for detailed photo's and a description of the site.